With instrumentation that includes saxophone, banjo, fiddles, mandolin, foot percussion, guitar, and voices, the Faux Paws pack a vast amount of music and heart into a small package. Folk powerhouse brothers Andrew and Noah VanNorstrand bring a deep, energetic groove to traditional and original old time, Irish, and Quebecois tunes. During their seventeen years leading popular contra dance band Great Bear, the brothers have honed their harmonies with their voices as well as twin fiddles. Together they have recorded nine albums of original music, even appearing on Garrison Keillor's A Prairie Home Companion in 2004. New listeners love discovering Noah's fiddle playing, which is unmatched. His technique of combining rhythmic "chopping" on the fiddle with foot percussion is simply jaw-dropping. Andrew's fiddle and guitar playing brings both sweetness and structure to the mix. The brothers are joined by Chris Miller on saxophone and banjo. Lopezians will recognize Miller from his Grammy-nominated Cajun/zydeco band the Revelers (who played the Lopez Center in 2016 and has since moved to the island!) Playing with the Faux Paws allows Chris to stretch out musically in many different directions. 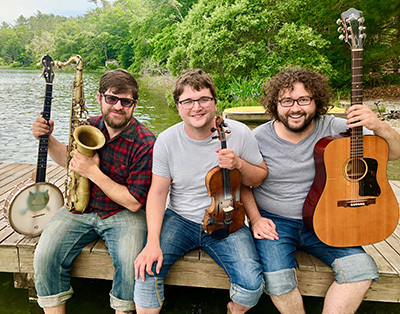 Having played together as a trio for eight years now, Andrew, Noah, and Chris have developed elastic, genre-transcending arrangements of traditional music, bringing in influences of rock and pop to their eclectic folk music base. A typical set shifts from intricately arranged compositions to completely spontaneous bursts of improvisation, but the music is always infectious, taking the audience along for a wild ride. JOIN US on Sunday morning for a brunch potluck and an hour of Waltzing with Andrew, Noah and Chris from Faux Paws.